Rephrite Jade radix cultura – Promoting chemical weathering as a tool to combate fake antique nephrite jade. Promoting chemical weathering as a tool to combate fake antique nephrite jade. Weathering is a natural process that breaks down all minerals and rocks and eventually transform them into soil. Without weathering there will be only rocks making plants, animals and life as we know it impossible. Such transformation leaves recognizable marks on the jade surface of burial jades as they underwent the same process similar to other minerals and rocks in a natural environment. Under a 40X magnification, these weathering marks including amorphous silicate, phyllocilicate clay, dissolution of nephrite crystals, and formation of iron oxides and iron hydroxides can be clearly seen as demonstrated on the Han disc magnified below. Chemical weathering on a Han disc under 20X and 40X magnification..
Chemical weathering in relation to burial nephrite jade. Weathering can be divided into physical and chemical weathering. Physical weathering refers to rock breaking apart due to natural forces like exposure to wind and water erosion, climatic heat expansion and contraction, shear force of ice and glacial into exfoliation and so on. Chemical weathering is chemical changes of the minerals in the rocks, induced by surface water, oxygen and carbon dioxide of the atmosphere. The result is the break down of minerals chemically and structurally, releasing cations into the environment, and eventually transform rocks into soil. All rocks contain more than one mineral. All minerals form crystal except when they are in the amorphous phase. A mineral is in amorphous phase when it maintains its chemical composition, but has lost its shape and crystal form. It is often seen in the burial jades as the whitish greyish pasty like material on the jade surface, often mistakenly referred to as calcification. Water is the main medium and the main driving force for chemical weathering. Also important are other variables like a hot, cold, dry or wet climate, the composition of parent minerals with different chemicals and crystal structures, and biological changes bring in by surrounding plants, animals and bacteria in the environment. All these make chemical weathering a very complex process. Chemical weathering is a well studied science in Geology, Geochemistry, Mineralogy, Clay Mineral studies, archeology and Environmental Science. Scientific papers on the subject come from scholars around the world. Changes seen on the burial jade surface so far have eluded explanation which underlies the reason why fake burial jades are so profusely produced. Since most burial jades are nephrite, an amphibole, knowing chemical weathering through these scientific papers on the mafic and felsic rocks; rocks and minerals that are iron rich silicates, provides a path for an authentication solution. Information comes mainly from clay mineral and geology scientific literatures. References are listed at the end of this segment. The first stage of Chemical weathering and the formation of amorphous silicate. Chemical weathering can be divided in two stages. Both stages can occur at the same time on the same surface of a mineral rock at various degree due to differences on the surface in drainage, micro pores size, and weakness points on the mineral, namely joints and cracks that can affect the chemical weathering effect. The mineral surface has different points of high energy, points where water flows through or retained. In burial jades high energy points are where the jade surface turns or drops off, the recesses and grooves from lines and cuts, and drill holes on the jade piece. These are areas where most weathering effects take place. Dissolution and leaching is the first stage of weathering. As water comes into contact of the mineral surface, it reacts with the chemical by replacing the cations, and in nephrite, calcium, magnesium and iron, that leach out in a higher ratio than the silicate. The result is the loss of cations and the fibrous nephrite crystals lose their shape and become amorphous. Amorphous silicate has a whitish to greyish color and appears pasty on the jade surface. A protonated surface about 10Å is formed. This is the surface where protonation, in other word the chemical reaction, takes place. Of significance is the protonated surface cannot be cleaned by ultrasound treatment, leaving a permanent mark on the jade surface, and a clue for authentication. (Y. Noack, F. Colin, D. Nahon, J. Delvigne, and L. Michaux. Secondary-Mineral formation during Natural weathering of pyroxene: review and thermodynamic approach. American Journal of Science, Vol. 293, February 1993. P. 111 – 134.) Extensive amorphous silicate formation can be seen on the Zhou (1046 – 256 BCE) jade man shown below. Notice the more heavy concentration of the whitish amorphous silicate beside the raised lines. The lines are positive relieves, formed by cutting down on both sides turning both sides into depressed grooves that retain water. Also when the jade piece was made, it creates fine granules from the cutting and drilling. It is well known in the scientific community that by simply breaking the mineral sample, these fine granules form. ( Mechanism of pyroxene and amphibole weathering – 1, Experimental studies of iron free minerals. Jacques Schotts, Robert A Berner and E Lennert Sjoberg; Geochimica et Comochimica Acta Vol.45, pp. 2123 -2135. 1981) These fine granules when meet with water, go into rapid dissolution skewing the scientific data. To clean them requires washing with a Hydrogen fluoride + Sulfuric acid solution. At the time the jade was made, because of the cutting and drilling, the cut lines and drill holes accumulate a large amount of such granules. These depressions also accumulate water and are high energy points. With more water available, rapid dissolution of these fine granules takes place, resulting in high concentration of the amorphous silicate in these depressions giving them a whitish delineated appearance well known in burial jades . The large amount of fine granules and water accumulation in drill holes also result in large amount of substrate inside the drill hole and formation of unusual secondary mineral products as we should see later. This accumulation of fine granules in the recess areas also can be seen on newly made jade pieces, and the higher concentration of the amorphous silicate in recess areas is greatly imitated by the fake jade makers. Notice also the multiple raised relieves on the surface of the jade man, a phenomena that will be discussed later. Weathering in the surface micro pores, a reason for color change in burial jades. 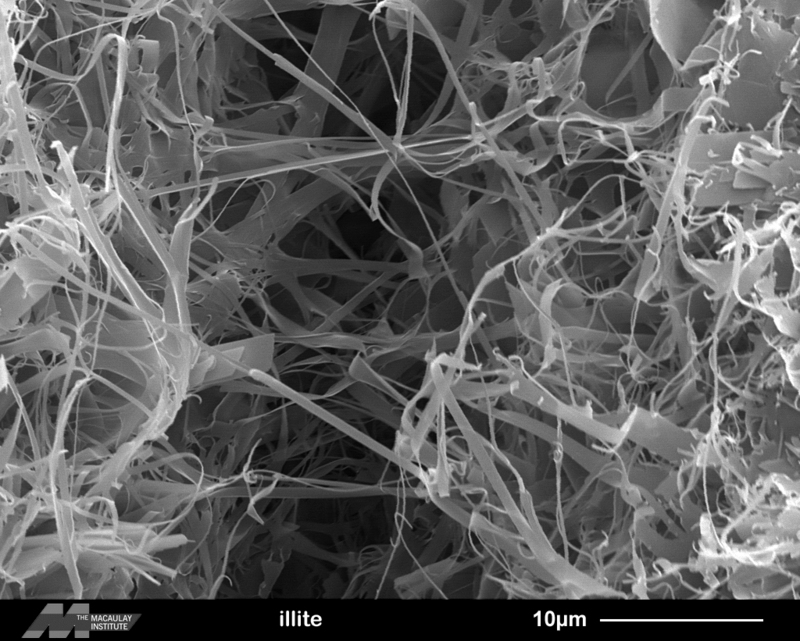 form inside the micropores, they can only seen by electron microscopy. Ferruginous projections called pendants extend from the microboxworks into the void. (MICHAEL ANTHONY VELBEL. WEATHERING OF HORNBLENDE TO FERRUGINOUS PRODUCTS BY A DISSOLUTION-REPRECIPITATION MECHANISM: PETROGRAPHY AND STOICHIOMETRY. Geochimica et Cosmochimica Acta Volume 45, Issue 11, November 1981, Pages 2123-2135. )These microboxwork and pendants exhibit the phenomenon of birefringence, meaning reflective light shine on them can only be seen at a certain angle. Several material exhibit birefringence and crystal is one of them. The specific of birefringence can be used to identify materials especially among minerals. The ferruginous material of the microboxwork are goethite, kaolinite and gibbsite. Smectite can weather into kaolinite. Both are clay minerals and such transformation occurs frequently. Hematite is also frequently found with amphibole weathering depending on the location in the world the parent mineral is from. Hematite is an iron oxide and has color of black, silvery grey, reddish brown and red. Goethite is an iron hydroxide and has color of black, brown, reddish brown and yellow. Kaolinite is a clay mineral with color of white to pale cream and yellow. Smectite has multiple members and they rang from yellow, brown, green and even black, depending on the amount of iron available. These weathering secondary products form inside the micropores and cracks of the nephrite, giving about 0.1 mm of the nephrite surface the color of brown, reddish brown yellow and may even black, the patina color of the burial jades. The Han beast on the left, and the Song frog on the right below have lost their original nephrite color and assume the color of the clay mineral and the iron oxyhydroxide inside their surface micro pores. Chemical weathering is the reason burial jades have such color. Understanding the process is key to identify fakes. When the burial jade pieces are looked at under the microscope obliquely, the color changes from the secondary products can be seen just underneath the surface in the micro pore system, whereas fake jades are dyed from top and remain on the surface. Secondary products can be seen spilling out from the micro pores to form pin point dots on the jade surface as on the magnified picture below on the curve surface of the Song frog, more noticeable on the right lower corner of the picture. Amorphous silicate spilling out of micropores. Chemical weathering on the nephrite jade surface and formation of ferruginous crust and phyllosilicate clay crystals. Other than inside the micro pore system, dissolution and leaching also occur on the jade surface resulting in etch pits formation as nephrite crystals dissolve. These pits are shallow due to the limit of water penetration. As in the micropores, when more etch pits are formed, they coalesce and enlarge. Amorphous silicate forms from leaching fills these etch pits. The surface of a Hongshan (4700 -2900 BCE) zoomorphic bird woman shown below demonstrates such effect. Notice that on the upper and lower part of the magnified picture on the right shows formation of phyllosilicate which has a yellowish shinny and grease like color with a reddish tint, an indication iron oxyhydroxide also present as weathering advances into the phyllosilicate / oxyhydroxide stage. Phyllosilicates are clay minerals which are silicates with a sheet like crystal structure. They can be divided into 1:1 or 2:1 clay, meaning, to put it simply, is that their structure can be 2 sheets which the Kaolin group belongs to, or 3 sheets which the smectite group belongs to. Recognizing phyllosillicate is important since they are frequently found on the surface of the burial jades. With time and availability of water and oxygen in the enviroment, smectite forms a brown to yellow pasty plasma on the surface. This plasma like material forms a thin filament crust on top. According to a Polish study, this filament measures 20-30 µm, about 0.2 – 0.3 mm. Because it is transparent, the presence of this filament is hard to recognize till you come across some of the jade pieces that were dropped in the past resulting in cracking of this crust. On one Liangzhgu disc (3400-2250 BC) with a diameter of 2 inches, such filament can be demonstrated. Like all Liangzhu discs, this disc is carved only on one side. The underside is flat. On the front, it slopes down abrutly when it comes to the side making a very sharp edge. Under the microscope, cracks can be seen on a whitish yellowish crust filament that covers the whole jade piece. A small piece of the filament is lost, and through this window, the real jade surface can now be seen (see pictures below). Without the cracks, even under the microscope, it is difficult to recognize this crusty filament. The presence of this filament makes the jade surface looks like it has depth, as if it is under water when look through the microscope. Crack and loss small oieces open up to the underlying jade surface. Natural nephrite obtain from an alluvial mine of dried up river bed are encased in a rock like crust formed from a process called encrustation pseudomorph. ( Picture below). frequently found than red inclusions. Below is a Zhou jade bird with red inclusions within the plasma layer on his crown. Red inclusions are also likely hematite. With progression of the weathering process, sheet like phyllocate (clay crystal), forms on the surface of the jade. They are more solid looking and less grease like as in the amorphous sillicate. These sheet like structures layer out and can have a reddish tint to solid reddish color indicating the presence of iron as seen on the Liangzhu (3400 – 2250 BC) disc below. Notice the demarcation of the phyosillicate (clay crystal) coming down from the upper left corner on the magnified photograph. phyllosilicate crystal crust can be better seen if the axe is look at obliquely as below. Hematite formation and hair like clay crystal. in several other burial jade pieces. The Xia bracelet shown below also has such hair like crystal structures. The exact nature of this structure is unclear. The closest resemblance is the illite crystal, a non expandable clay. Another possibility is Byssolite, an Amphibole Supergroup, a variation of Actinolite. The presence of clay mineral on the surface of burial jades as a secondary product of chemical weathering, results in a well known phenomenon. It has long been known that some of the burial jades process an odor commonly referred to as the ‘tomb odor’. The odor does not come from the tomb, but from the clay produced on the jade. Clay is one of the few minerals that give out an odor. https://www.scientificamerican.com/article/the-odors-of-minerals/ As clay material is formed on the surface of burial jades from chemical weathering, under certain conditions, such clay will give out an odor that jade collectors are so familiar with, and so mistaken with its origin. Iron oxide mineral crystal formation on jade surface and in drill holes. Liangzhu plaque with red crystal formation, most likely Hematite. photo. These metal deposits appear as droplets, and they all show the birefringence effect, seen only at a certain angle, making finding them a difficult task at time. Below is a Zhou comb that also has the metal droplets on its surface, seen at the center of the magnified view below . Metal droplets in association with the Hematite formation is not the only metallic finding on the burial jade surface. Small pin point like metallic shine with a bright golden yellow color are often seen on Han or older pieces. Unlike the droplets, which appear at random, these metal shines always appear in a line, be it curve or straight, and like the droplets, they also exhibit the birefringence effect. The presence of such lines can be demonstrated on the Hongshan beast below, seen in the middle of the magnified view. Tiny metallic points forming a line. Han beast with metallic line. nature of these metallic points line is uncertain. However since they always appear in a line, they probably are related to the cleavages of the nephrite jade. Needle Hematite crystal under microscope in drill hole. only Hongshan piece that has such crystal formation, indicating such crystals can be found in many genuine Hongshan pieces. Other crystal formations on the surface are more difficult to understand, like on this Hongshan birdman below. Effect of cleaning on jade surface. Xia mask previously cleaned with removal of the clay and ferruginous crust. The protonated layer and the patina color caused by the clay and ferruginous material in the surface micro pores cannot be cleaned. Reminant of the crust can be seen on the lip and the left side of the nose. exposes other markings from weathering as seen on the Han cicada below. Notice the loss of mineral crystal material on its right side of its head, both eyes and back, from the leaching and dissolution stage of weathering, resulting in shallow etch pits as if a small piece of the skin was removed, and formation of the protonated layer where the chemical reaction took place (on the magnified view). Han cicada with loss of crystal material from the leaching and dissolution stage. Loss of mineral from leaching and dissolution with frmation of etch pits and protonated layer. How much burial jades can be cleaned, and whether they can be returned to their original nephrite luster is controversial. The National Museum in Beijing China has done just that showing several of their burial jades pieces returned to their original nephrite color. This promptly leads to Western archeological communities criticism, that such feat is impossible and suspicion that these are newly made fakes. The patina color change is due to the chemical weathering effects on the surface of the burial jade. Due to the limit of water penetration, such effect only limits to the surface 0.1 mm or so. It is therefore possible to grind off this topical 0.1 mm and the jade should return to its original nephrite color. However by doing so will also eliminate much of the details of the surface carving. The value of the burial jades lies not in the nephrite, but in the art and spirit of the carving that reflects the thinking and culture of the carvers, people of the period of time. Any damage done to the carving will result in great loss. Further more, markings left from the chemical weathering are the strongest proof, and may be the only proof that the jade piece is authentic. Removing these markings by grinding the surface will render the piece losing all its identity, and hence no difference from a piece made nowadays. Raised relief on nephrite jade artifact, what it is and confirmation of chemical weathering on Nephrite jades. The only scientific article exploring burial nephrite jade with regard to geologic mineral changes is “Raised relief on nephrite jade artifacts: observations, explanations and implications. Journal of Arcaeological Science, 40 (2013) 943-954.” by Frederick A. Cook. This is truly an excellent pioneer work in this field that deserves all the respects given to a true insight into the chemical weathering on burial jades. In this article Professor Cook investigates the notion that raised relief can be found on the surface of burial nephrite jades, and the presence of such relief if proven genuine, can be used to confirm the authenticity of the artifact. The article provides confirmation to observations already discussed in this writing. However it also posts other questions that are worth looking into. The article divides the raise relief into two categories. One is a raised crystal, often single, but can be in groups. The other is a patch or areas higher and above the observed jade surface. These patches contain no raised crystal as in the other group, but are made up with fibrous normal nephrite crystals. Judging from the pictures of the artifact specimens in the article, one can easily see that all artifacts except number 4 the Neolithic Bi disc, and number 6 the circular bowl with a stand, the surface has been previously cleaned. (One side note is that judging from the bird headed hunter on the circular bowl, as compared to the bird headed people on the Han disc posted at the beginning of this chemical weathering writing, the circular bowl should be a Han piece and not Tang.) The patches being referred to as raised relief appear to be the remnant of the clay phyllosilicate crust left behind after the previous cleaning. The crust is above the surface, but certainly is not raised, a reason why underneath the patch normal fibrous nephrite crystals are found. Of some interest is specimen number 4, the Neolithic Bi Disc. This disc was not cleaned, and phyllosilicate clay on the surface is obvious, easily seen especially on the magnified view. Part of the disc was under cover from another disc. As a result less water was available on the part of the disc under cover, and that part of the disc has far less weathering effect, and hence far less clay phyllosilicate on the covered part of the disc surface, demonstrating the importance of water in chemical weathering. with its raised relief magnified shown below. Notice the similarity of the raised relief on the monster man and those found on the circular bowl on figure 6. Magnified raised relief on the squatting monster man. C-dragon with multiple raised relief. Squatting beast with raised relief and magnified view. raised relief on the other two Hongshan pieces. Unlike those on the other two that are crystals in a cluster, those on the squatting beast are individual crystals. They also differ in texture, smooth with a Smokey semi transparent color and no metal deposit, a resemblance to Smoke Quartz. The differences between the raised relief on all three pieces indicate that they are probably different mineral crystals. There may be more than one kind of crystal forming raised relief. The raised relief was thoroughly investigated scientifically in the article. Thin slides made from specimen 6, the bowl with stand, were chosen for petrographic microscopy and electron microprobe examination and analysis. The raised relief selected is a single pyroxene crystal, a diopside on the jade surface. There are other diopside crystals found, all at or near the surface of the bowl. The assumption is that these pyroxene crystals are formed during the nephrite metamorphic formation. As the nephrite was pushed from the crust of the earth to the surface, hydrothermal alteration continues the alteration of the diopside to tremolite. Since the pyroxene was present during metamorphism when the nephrite was formed, it has to be inside the nephrite before the jade piece was carved. If such is the case, the diopside should be found any where inside the nephrite, and should not only be at or near the surface. One interesting finding is that the red brown color on the surface of the bowl is limited to 0.1-0.2 mm of the surface, a finding consistent with the changes result from chemical weathering inside the surface micro pores due to the limit of water penetration as already discussed. The raised relief is a large crystal, in this case a diopside, intersecting the surface, and surrounded by fibrous nephrite crystals. The nephrite crystals are in two forms, a coarse altered form found immediate to the diopside crystal, which in turn are surrounded by the more fine fibrous tremolite crystals. It is felt that the diopside crystal is altering into tremolite crystals, as in hydrothermal alteration, resulting in the tremolite fibrous mass. The diopside crystal shows twinning with coarse tremolite veins in between. Of more revealing are the electron microprobe analysis. (figure 11-12, table 2) Other than the diopside crystal and the fine and coarse tremolite crystals, hydrous phase material and chlorite are found. Because the hydrous phase materials are high in aluminum and magnesium it is determined that the hydrous materials are clay minerals, and chlorite will eventually alter into it. Of interest to note is that the altered tremolite, the hydrous phase material, and the chlorite are all high in iron oxide (FeO). The conclusion is that the clay is expansive. The expansion of the clay increases the volume resulting the diopside being pushed to the jade surface forming the raised relief. This conclusion is reasonable. However it does post some questions. The pushing due to the expansion of the clay is mechanical, and not gravitational dependent. Further more when the jades were buried, they were placed face up or down or side way. So the diopside crystal can be pushed in any direction and not necessary towards the surface. This assumption cannot explain why all the raised relief are at the surface of the jade. Also a well known fact about the expansive clay is that found around building foundations. The expansion can cause cracking of the foundations leading to crumbling of the building. Clay expansion within the jade should create large cracks around the diopside crystal. Micro cracks sre found in the round bowl specimen. Micro cracks are known to form during chemical weathering. The diameter of the micro pores on the nephrite are 1µ – 2 µ. Leaching and dissolution during chemical weathering leads to enlargement of the micro pores to 5µ and formation of micro cracks. Expansion and pushing should create much larger cracks, and with thousands of years of burial and pushing, may even lead to dislodgment of the diopside leaving behind a void. Such are not found leaving more questions to the assumption of clay expansion theory. and a copper pseudomorph after aragonite. (picture from James St John, Wikipedia.) Regardless of what the raised relieves are, its presence should confirm the authenticity of the burial jade. The article studies confirm nephrite chemical weathering secondary products. Chlorite has been reported, and it eventually alters into clay minerals Smectite and Kaolinite. The secondary products have also been described as ferruginous because of the high iron content. Iron secondary minerals are iron oxide Hematite, and iron hydroxide Goethite. MICHAEL ANTHONY VELBEL. WEATHERING OF HORNBLENDE TO FERRUGINOUS PRODUCTS BY A DISSOLUTION-REPRECIPITATION MECHANISM: PETROGRAPHY AND STOICHIOMETRY. Geochimica et Cosmochimica Acta Volume 45, Issue 11, November 1981, Pages 2123-2135. 1. Y. Noack, F. Colin, D. Nahon, J. Delvigne, and L. Michaux. Secondary-Mineral formation during Natural weathering of pyroxene: review and thermodynamic approach. American Journal of Science, Vol. 293, February 1993. P. 111 – 134. 3. J. Cuadros. Clay crystal-chemical adaptability and transformation mechanisms. Clay minerals, (2012)47, 147-164. 4. D. Proust, J. Caillaud, C. Fontaine. Clay minerals in early Amphibole weathering: Tri- to Dioctahedral sequence as a function of crystallation sites in the Amphibole. The Clay Minerals Society, 2006. 9. Frederick A. Cook. Raised relief on nephrite jade artifacts: observations, explanations and implications. Journal of Arcaeological Science, 40 (2013) 943-954. 10. Mariola Marszałek, Zofia Alexandrowicz, and Grzegorz Rzepa. Composition of weathering crusts on sandstones from natural outcrops and architectonic elements in an urban environment. Environ Sci Pollut Res Int. 2014; 21: 14023–14036. 11. MICHAEL ANTHONY VELBEL. WEATHERING OF HORNBLENDE TO FERRUGINOUS PRODUCTS BY A DISSOLUTION-REPRECIPITATION MECHANISM: PETROGRAPHY AND STOICHIOMETRY. Geochimica et Cosmochimica Acta Volume 45, Issue 11, November 1981, Pages 2123-2135. 12. M. J . WILSON. Weathering of the primary rock-forming minerals: processes, products and rates. Clay Minerals (2004) 39, 233–266. Volume 47, Issue 12, December 1983, Pages 2233-2240. 左邊是肉, 右邊是手, 肉舆手間是下滴的血. 有以有血下滴的生肉是為祭品,奉獻給神祖為食物.但這說法有所不妥,因鼎為煮肉及放已煮熟肉的器皿,(玉篇.鼎)”鼎’器也.所以熟食者”,而鼎也是用以祭祀的重要禮器,所以祭祀用的肉應是煮熟的肉.而不是有血下滴的生肉,以手持有血下滴的生肉,奉獻給神祖為食物的說法, 並不成理.説文上說祭字從示,”示”的意義是神也是祖,所以祭祀的對象是神祖.但甲骨文祭字並没有從示, 示要到金文才在祭字上出現.那就是說以手持有血下滴的肉,已包含了示的意義. 而這有血下滴的肉,應就是神與祖的代表. 肌肉是神祖所在.肌肉紋刻在神人身上, 是說神人不單是皇且是神祖. 上(框上) 的鳥, 把皇祖的靈, 載至日中, <山海經.大荒東經>,”湯谷上有扶木,一日方至,一日方出,皆載於鳥” , 便有了意義. 良渚的宗教思相,不單在祖宗崇拜上與夏商周宗教有極大相同,且許多夏商周的信仰,可以追至良渚文化上. 中國上古神話的皇與日與鳥的相互關連,可在良渚文化中看到影子, 圖二十二的靈字是指皇之靈,也是光芒四射的太陽,下為山,也可作為土字.江林昌先生說”帝字皇字,都具光明之義,有明顯的太陽神特點.”(中國上古文明考論,395頁),皇字有太陽的意義從何而來?良渚靈字日的部份刻有肌肉紋, 是皇祖的靈所在. 皇祖與日關連的思想,在良渚時期己存在. 鳥是皇祖的靈與日的媒介. 鳥把皇靈帶至日, 所以中國上古的鳥與日, 如金沙四鳥環日(圖二十三), 與河姆渡的雙鳥拱陽, 都應有皇祖的意義在內. 與良渚神獸有異, 但也不難看出, 這是良渚的有鼻神獸, 皇祖的標誌, 越王勾踐劍上的鳥篆是四字一句共四句十六字,刻有鳥篆的玉環上都是四個字, 而這臉面是三個, 在良渚文化上, 與皇祖有關的數目都是三, 進一步說明, 這環上臉面, 是良渚皇祖, 也証明了良渚的宗教思想, 至周代還留在吳越地區. 教由西方傳入, 尤其是佛教, 代去了中華本有的宗教思想, 良渚思想也不能例外, 彿教成了中國的主流宗教思想, 雖則彿教並沒有祖宗崇拜的成份, 而祖宗崇拜還是在中國廣大流傳 以至現今社會. 可見良渚時期的思想, 還是深在中華文化裏. Ten years ago, as a tourist in a remote Central America tourist destination (not Mexico), I saw a street peddler, selling stone made tourist items. Behind all his poorly made uninteresting items was a single green stone statue that stood out as unique. With no knowledge of the South American culture, the first thing that came to my mind was Chinese fake jades coming to Central America. Curiosity drove me to picked up the statue and looked at it carefully. The statue was a handmade jadeite. Part of it was done by chipping and flicking, a technique not used by Chinese jade carvers ancient or recent. This could not be Chinese made. As it fitted into my category of souvenir with a local flavor I decided to buy it. After a short hackle, the man agreed to sell the statue for 75 US dollars. Later research showed that a similar statue was in the Dumbarton Oaks collection, the Aztec goddess Tlazolteotl carved between the late 15th and early 16th century. Tlazolteotl was a goddess of filth and vice, especially sins of sexual misdeeds. Paradoxically she also was the patroness for forgiving sins of such misdeeds, and a purifier for sins and diseases caused by these sexual transgressions. These seemingly contradicting believes made her the goddess of purification, steam bath, midwives, filth and adulterers and appropriately as a statue of a woman giving birth. At the time these were interesting but not for long. It was promptly forgotten and ignored for ten years, sitting among my other memorabilia from my travels. Recently when I was researching for Chemical weathering on buried nephrite jades, I came across the article, “The Dumbarton Oaks Tlazolteotl: looking beneath the surface “, by Jane MACLAREN WALSH, JOURNAL DE LA SOCIÉTÉ DES AMERICANISTATE, 2008, 94-1. “ (To read the article and to see a picture of the Dumbarton Oaks Tlazolteotl , click on the following link). http://journals.openedition.org/jsa/8623 The Dumbarton Oaks Tlazolteotl was found to be made in the 19th century. The jadeite Tlazoteotl in my collection was taken out and looked at carefully under a 40X stereomicroscope. It is my belief that the existence of a jadeite Tlazolteotl and the finding on the statue deserve to be known. All of the descriptions and history of the Dumbarton Oaks Tlazolteotl are based on the detail study by Jane Maclaren Walsh in her article. Comparison of the Dumbarton Oaks Tlazolteotl and the jadeite Tlazolteotl. Fig 3 jadeite Tlazoteotl face. and prominent eyebrows. There is no drill hole on her. Her mouth gaps open with well defined teeth on her upper jaw and no teeth on the lower jaw, a difference from the Dumbarton Oaks Tlazoteotl that has well defined teeth on both the upper and lower jaw. It is interesting that many of the Pre-Columbian jade masks in museums only have teeth on the upper jaw. The lower jaw either has no teeth, or represents by a smooth ridge, similar to the jadeite Tlazoteolt. Fig 4 below shows the mouth of the jadeite Tlazoteotl on the left as compare to an Olmec mask from the Latin American studies, http://www.latinamericanstudies.org/olmec-masks.htm on the right. Similar finding can be seen on the Olmec mask in the Metropolitan Museum of Art https://www.metmuseum.org/art/collection/search/310279 , and in the Boston Museum of Fine Art http://www.mfa.org/collections/object/portrait-mask-36451. Fig. 4a. Mouth of jadeite Tlazolteotl with well defined teeth on the upper jaw. Only a smooth ridge on the lower jaw. round, Both statues lower legs are angled backward, a very significant finding as to the positions they are in. The similarities between the statues give the impression that there is a relationship between the two statues. But the discrepancies are significant making it unlikely that they are copies of each others. more I could keep my upper body upright. My lower legs angled automatically backward. If I squatted down too low, I tended to fall. By placing both of my hands underneath my buttock, I could actually lift my body slightly upward, and kept my balance. The jadeite squatting position is not only feasible, and placing both hands uner the buttock is a good way to stabilize oneself in that position. Next I attempted the Dumbarton Oaks Tlazoteotl sitting position. ( See Fig. 3 in the Dumbarton Oaks Tlazoteotl article http://journals.openedition.org/jsa/8623 ). With myself sitting on the floor legs bent in front of me, I was unable to keep my upper body upright. The position forced me to lean backward. To support myself, I had to place both of my hands out on my sides and back. Placing my hands underneath my buttock was impossible. With my legs spread apart my lower legs bent angled forward. An attempt to bend my knees to angle my lower legs backward resulted in severe strain on both knees causing great pain. The biggest problem is the infant. In this position, as the infant emerges, his head will hit the ground, and the length of the baby will prevent him from coming out safely, unless the woman leans way back to almost flat on her back. My conclusion is that the Dumbarton Oaks Tlazoteotl sitting position is not only impossible to obtain, but is also unsafe to give birth. There are many versions of position to give birth today. The most common one is the woman lying on her back with her legs up spread wide apart, knees bent angling backward in stirrup. This is a lying version of the squatting position. If you rotate the picture to put the woman’s body upright and feet down, you can see her actually is in a squatting position. The squatting position the jadeite Tlazoteotl in is a natural position to give safe birth. A woman can be in a sitting position when she is in labour. As soon as the infant is crowning, she has to go into the squatting position for delivery, especially if she is by herself. Going into the wood by herself to give birth is a known American Indian women practice. The jadeite Tlazoteotl lacks the authoritarian, self confidence and commending expression of nobility and goddess. Her expression shows psychological pain more so than physical, of a woman in depression, a phenomenon common during pregnancy before or after the delivery. Such psychological trauma cannot be experienced by a man. The jadeite Tlazoteotl is more likely carved by a woman. The tool marks on the Dumbarton Oaks Tlazoteotl were thoroughly studied using Scanning Electron Microscopy on positive silicon impression technique. It iwas the tool mark study that confirmed the Dumbarton Oaks Tlazoteotl was carved in the 19th centaury. No sophisticated examination can be done on the jadeite Tlazoteolt . However examination under a 40X stereomicroscope can still yield insights into the statute. In her article, Jane MacLaren Walsh gives a detail account of Pre-Columbian lapidary technology. The tools used were essentially hard stones and various types of sand abrasives. The stone to be carved was first cut to size splitting with wood wedges,or cutting with lines or stone saws. Techniques used for more detail carving were chipping, scrapping, grinding, filing, and piercing with solid pointed stones, all with stone tools and abrasives. Drilling were done with bamboo or bone. The surface was then polished with materials like wood and animal skins together with fine abrasives. With that in mind, lets look at the tool marks to see how the jadeite Tlazoteotl was carved. Rise and fall with nodes like intervals on the arm. carve the knives. He stroked down at an angle towards the stone to be carved. As his tool hit the stone, he flicked his wrist to direct his tool upward, to avoid cutting too deep into the stone. This resulted in a shallow pit with raised edges, as seen on the stone knives. The jadeite Tlazoteotl carver then further scraped and grinded to rid of the roughness, and finally polished it into the arm. Ridges are left, giving the arm an unique look of the chipping. are carved straight down. The bottom of both eyes are uneven slopping up from the side to the center resulting in a small mound. The carver used a chisel like stone tool pecking straight down on the side of the eye socket making a groove. He then went inside the eye , and with his tool slanting towards the groove on the side, he chiseled away the stone material to make the eye. By repeating the chiseling, the stone material inside the eye eventually was all chiseled away leaving the eye formed as a void. The result is an eye with a straight down socket wall, and a bottom sloping up from the side towards the center, as with the jadeite Tlazoteotl eyes. The eye then became a small pit, too deep for stone tools to scrape and grind and polish like he did with the arms, leaving the roughness and a small mound at the bottom. limited by his straight stone tools, to make the turn, he repeatedly file the same part of the line back and forth at a different angle, resulting in bulging of the line at the turn, and notches made by the tool going through outside the opposite side of the line. All the tool marks indicate that the jadeite Tlazoteotl was made with stone tools. The statue is not in good proportion. Her head, thighs and legs are too large for her body, and her arms too short. She has a beauty of naiveté, often seen in Mesoamerican arts. Chemical Weathering effects on the jadeite Tlazoteotl. Appication of chemical weathering effects in Archaeology to my wishful thinking is in its infancy. In reality it probaly has not been born yet. Waiting to be recognized is that observing chemical weathering effects on buried lapidary is a great tool for Archaeology, espicially to idetify recently made forgeries. My experience with chemical weathering effect is with Chinese buried nephrite. The statute here is jadeite. Both nephrite, an amphibole, and jadeite, a pyroxene, are mafic minerals, meaning they both are silicates rich in magnesium and feric (iron). According to scientific literatures, chemical weathering process for mafic minerals are similar, only with different secondary products produced, which can vary just by changing the location of the burial site. Changing the locality influences greatly chemical weathering because the climate conditions are changed. Looking at the jadeite statue, the chemical weathering effect may not be exactly like that on nephrite, but they are certainly there on the statute surface. Fig. 11. Rotated Jadeite statue to show the burial position. water. More water was availble at the lower part of the soil resulting in more chemical weathering effect on the face and front of the statue. Also noticable are lines as depressed groovs, retained water that produced secondary dark color products, making the lines appear black in color. This secondary product not only delineates the lines, but also form black patches, mostly on the front of the statue. The black color indicates that it probably is related to iron, likely an iron oxide hematite. Looking through Olmac masks on line, the one in the Boston Museum of fine art, has similar black patches on his face. Fig 12. Close up on the right eye showing the protonation layer covering the mound and the socket of the eye. Fig. 13, Secondary products inside the micropores as fine dots. they appear as if they were under water with a depth. Several kinds of minerals can be form as secondary products. In here most are black, probably an iron oxide, some have a metallic shine, and some have a greenish blue color, most likely a mineral containing copper. A larger patch of the bluish green mineral is found on the inner wall of the right eye socket (Fig.14). Fig. 14. Patch of blue green mineral inside the right eye socket. Clay minerals as secondary product can form within the matrix of the jadeite between the jadeite crystals. It gives the jadeite a cloudy look as seen on Fig.13. As more secondary products form, the color change becomes more intense and with time, the color becomes solid giving a patina of the antique jade we all familiar with. Chemical weathering changes occur only within the surface 0.1 mm or so. The optical illusion is what gives the impression that the whole jade piece has changed into that particular color. The Chinese fake jade makers actively simulate the chemical weathering effect on the jade surface. Such practice does not seem to occur in Latin America. Looking through the on line pictures of the Olmec masks, many of them do not seem to have a chemical weathering effect. They were made with various types of stone with no regard to the stone color of the original. The Chinese also use different types of stone. But always with a color similar to changes from chemical weathering. To create the effect of Chemical weathering, they also use dye, usually with a color dark brown to black, and using heat and manipulating the PH of the solution to drive the dye into the nephrite to simulate the patina color. Such practice also does not seem to occur in Latin America. To identify these forgeries the first thing to realize is that the dye comes down to inside the jade from above. In a natural chemical weathering process the secondary products are produced inside the micropores underneath and spill up to the surface. The dye goes into the jade surface through micro cracks. Under the microscope it shows up as thin lines next to a large patch of dye. In a natural chemical weathering process, the secondary products in the micropores show up as tiny dots frequently away from any large patch of dark chemical, as seen in figure 13. The dye can also infiltrate into the matrix to give a cloudy look color change. Forgeries take a very short time, may be several days, to perform, comparing to the natural weathering process which takes several hundreds and may be thousands of years. Dye altered color change is uneven with areas with no dye showing color of the polished stone. Since the source of the changes come from the dye, large patch of dye on the surface has to be next to these changes. For the buried jade to show a matrix color change requires at least 500 years. The color change is more evenly distributed, and you may not see any dark patches or chemical on the surface. Other techniques to make fake buried jade are using strong acid or alkaline to create a destructive burnt, easily identified under a microscope. Using sand blasting to make holes on the surface is also a frequent forgery trick. Contrary to popular belief, holes on buried jade are not common. It can also be easily identified from natural etch pits under the microscope. Fig. 15 Orange mineral inside left eye. Fig. 16. Hair like crystals in right eye. far too many unanswered questions in chemical weathering. Yet for certain it is a great tool. Its application awaits the scientific community’s exploration. For many reasons the jadeite Tlazoteotl cannot be authenticated. It has no provenance. Buying it from a street peddler as a tourist is not one. We do know it is not an item made for the tourist trade, since for the last ten years no other jadeite Tlazoteotl was seen, sold to, or bought by a tourist. It is also not an item commissioned by a dealer to sell as an antique artifact for profit. There is no dealer involved, and 75 US dollars cannot even pay for a piece of raw jadeite mineral of similar size. But there has not been a scientific research done on the statute. Looking at pictures on line cannot be counted as one. Top it all, the account is given by an amateur whose experience with Mesoamerican artifacts is limited to one, a number not a statistic. That the statute is Aztec, and may even be its very existence, are at best questionable. However for a meaningful discussion these two assumptions are required. If the jadeite statue is Aztec, then is the Dumbarton Oaks Tlazoteotl a copy of the jadeite Tlazoteotl? To answer this we must first find out where the Dumbarton Oaks Tlazoteotl was carved. We know that the Dumbarton Oaks Tlazoteotl was carved in the 19th century with power tools. Mexico started electricity in 1879 in Leon. It was privately owned for the textile industry, and electricity was not available to the general public until early 20th century. The Dumbarton Oaks Tlazoteotl therefore could not have been carved in Mexico. Electricity was available to the general public in Paris in 1881, and promptly spread to all segments of the society. Since all power tolls at that time needed to be invented, they had to be the most sophisticated tools available. The Dumbarton Oaks Tlazoteotl could only be carved after 1881 in Paris, by an European artisan with an ability to carve an exact copy of the original. But the discrepancies between the two statues are too great to be an exact copy. So how did the Dumbarton Oaks Tlazoteotl come into being? To answer that we need to go back to the very beginning of the Dumbarton Oaks Tlazoteotl story, described in detail in the Walsh article. The story is confusing because of so many characters involved. To see clearly, all questionable characters need to be eliminated, leaving those for certain involved. The most important character was Eugène Boban Duverge (1834-1908), a French antiquarian with credentials as the official archeologist in the Mexican royal court, a member of the French Scientific Commission in Mexico, and a dealer of Mesoamerican relics in Paris. The first description of the Dumbarton Oaks Tlazoteotl was in a note hand written by him on May 28, 1883. He also mentioned that the statue was brought in by M. Damour, a mineralogist from the Academy of Science for consultation, and Damour bought the statue from a Mr. Wan who bought it in an auction. The Mr. Wan part of the story was discredited by Walsh in her article. That puts the M. Damour part of the story in question. Hamy, the president of the Paris Amercanist Society, in his 1907 article did mention that the statue was acquired by M. Damour with no mention of where Damour obtained the statue from. In his earlier writing in 1899, Hamy wrote he saw the Statue earlier in Eugène Boban ‘s antique shop, confirming that Eugène Boban was the one selling it. It further put in question that the statue was brought in by Damour to Eugène Boban for consultation. Since Damour was a mineralogist, the reverse may be the truth. Also if Damour did not buy it from Mr. Wan, the only one he could have gotten it from would be Eugène Boban. Eugène Boban was likely the owner of the Dumbarton Oaks Tlazoteotl from the very first beginning. The most likely scenery of the story is that Eugène Boban commissioned the carving of the Dumbarton Oaks Tlazoteotl, and sold it to Damour in Paris as a genuine Mesoamerican artefact. Eugène Boban had a history of selling known forgeries as genuine artifacts in the Paris antique market, notably the three 19th century made crystal skulls. To carve and made the Dumbarton Oaks Tlazoteotl he must have the knowledge of the existence of such a statue. But all indication he did not see the original. As a well respected and powerful French antiquarian with credential in the Mexican royal court, in 19th century at the height of colonialism in central America, if Eugène Boban saw the original statue, he would have processed it, and if he processed it, he would have sold it in the Paris market like he did with so many genuine Mesoamerican artifacts. The fact that he did not sell an original means he could not have seen it. But if he did not see an original, how could the Dumbarton Oaks Tlazoteotl come into being. Eugène Boban came to Mexico as a teenager. He not only could speak fluent Spanish, he self taught and knew Nahuatl, an Aztec and their descendant language. That means he not only was able to communicate with the Aztec descendants, he also had a very good relationship with them. Also for certain, he was actively inquiring about Mesoamerican artifacts for acquisition. The existence of such a statue was related to him by the Aztec descendants. A picture based on an oral legend was drawn. The picture was the blue print for the Dumbarton Oaks Tlazoteotl, resulting in the similarities and discrepancies of the two statues. Mysteries are wonderful. The only draw back is there may not be an answer to satisfy everyone. Jade is a beautiful gem stone. With its smooth luxurious texture, glossy semi transparent appearance, top it with a pleasant white or green color, jade has been part of the Chinese culture since the Neolithic time. From the very early on, it was regarded as a stone with mystic power and the medium of choice for religious expression. The association with religion also brought on the representation and association with power and wealth. This deep affection and the belief in the mystic power of jade linger on turning into thinking that jade cannot deteriorate even after several thousands years of burial. In a sense it is true. Jade pieces survive several thousands of years, much better than many other materials of the same period of time. But the deterioration is there if one looks. It is this deterioration that nature left on the jade surface that gives clues to the authenticity of the period the jade piece was carved. To understand these changes, one must know some fundamentals of the nephrite jade. mutton fat nephrite, rich in magnesium . The two different types of jade are nephrite and jadeite. Jadeite is not native to China and did not come into China from Myanmar until the Ming dynasty. All jade pieces before the Ming dynasty are nephrite. Both jadeite and nephrite are minerals. Jadeite belongs to the pyroxene group, and nephrite belongs to the amphibole group. Both are inosilicate minerals, meaning they are silicate groups containing silicon and oxygen. They form prism or needle like crystals and contain iron and magnesium in their structure. Nephrite is a combination of two amphibole minerals, tremolite and actinolite in various ratio. Tremolite and actinolite are both calcium magnesium iron silicate with traces of sodium and aluminum. They share the same chemical formula, Ca²(Mg,Fe)5Si8O22(OH)², and similar physical properties with specific gravity of 2.95 (+.15, -.05). Both actinolite and tremolite have a hardness of Mosh scale 5.5 – 6, and nephrite has a Mosh scale 6 – 6.5. The color of tremolite are white, grey, black, yellow, green, pink and purple. The pink and purple varieties are mainly found in Lawrence county New York and are not found in China. Tremolite is white when there is more magnesium in its composition, and green when there is more iron. Iron is what gives the jade yellow to green color. Actinolite is iron rich with color of various shade of green to black. In nephrite, when the ratio of the magnesium rich tremolite is higher than the iron rich actinolite, it is white. Both of the above two samples are nephrite roughs. On the left is iron rich and green. On the right is magnesium rich and white. Today any nephrite with 90% magnesium rich tremolite, and therefore has a greasy white mutton fat color, is called Hetian regardless where it comes from. Gem minerals including nephrite form inside the crust of the Earth, with the only exceptions of peridot and diamond which form in the mantle. Under high temperature and pressure of the earth crust, nephrite is formed by metasomatism of dolomite by intrusive magmatic fluids, or silicic rocks by serpentinite fluids. This results in nephrite being encased in igneous and or metamorphic rocks, mixed with small amount of other minerals, diopside, magnetite, chromite, graphite, apatite, rutile, pyrite, datolite, vesuvianite, prehnite, garnet, talc and sphene. In China, nephrite from the Kunlun mountains are frequently associate with Pyroxene rocks, and those from the Karakash valley in Xinjiang province are frequently with Hornblende rocks. Thus nephrite are encased in other rocks making them difficult to identify. Nephrite in the primary deposit are deep underground, encased in rocks and therefore in general are not mined due to the expense of necessity to remove millions tons of rocks to obtain the mineral. With volcanic and tectonic activities, part of the primary deposit breaks off and uplifted to the surface from the crust to become the secondary deposit. There are two types of secondary deposit, eluvial and alluvial. As the deposit is pushed to the surface, weathering breaks down the hard encasing rocks and becomes a mount of debris with the mineral inside, forming the eluvial deposit. Nephrite mostly come from such mines probably exclusively before the Qing Dynasty. Within these mines nephrite are found encased within other minerals and rocks (坑玉). Identifying rocks that contain nephrite within can post challenges to nephrite miners and hunters. Alluvial is when the primary or secondary deposit further erodes, broken off and finds its way tumbling down a river or stream. Way to obtain the mineral is usually by panning, as in panning for gold, or dredging in a larger scale mining. Minerals can also be found in dry up river beds. In such case hydraulic washing is the way to obtain them. Nephrite pebbles in rivers are found among similar size pebbles and rocks, making them unsuitable for panning. To mine such river pebbles traditionally in China, several people walk abreast, wading across the shallow river. As they wade across, they feels the pebbles on the river bed with their feet. Experience tells them which pebble to pick up for examination. However some believe that it is more accurate to say when wadding across they look down to pick up what looks like a nephrite pebble. River nephrite pebbles are less angular, smooth, polish and smaller due to constant rolling and tumbling in the stream. Most of the pebbles have areas of reddish and other discoloration called skin. The recent high demand of nephrite jade in China has basically exhausted the Xinjiang deposits. With unabated demands price of nephrite pebbles sky rocketed. Escalating high price brings out fake nephrite pebbles. How to identify the fake from the real nephrite pebbles becomes a problem. China in 2015 puts out a paper title “Identification Characteristics of Weathering Crust for Nephrite Gravel and its Imitation. Hui Li , Xuan Wang, Yong Zhu, Zhengyu Zhou. 5th International Conference on Information Engineering for Mechanics and Materials (ICIMM 2015)”. In the paper the authors identify three distinct points of difference between the nephrite pebbles natural weathering from the artificial applied changes. Something resembling sweat pores are found on the surface of the natural weathered pebbles. These sweat pores are irregular, varied in shape and sizes, with some of these sweat pores connected, and some have smaller sweat pores within a larger one with the appearance of an island. These sweat pores are thought to come from collision with other pebbles and rocks in the stream. The artificial sweat pores are made from sand blasting, and the pores are uniform in size and shape with edges round and smooth, unlike the natural sweat pores. Nail pattern formation on the natural weathered pebbles. These pattern are thought to be from the nephrite breaking from he primary deposit and collision in the stream. The artificial ones are more smooth and uniform. Artificial color changes on the crust of the false nephrite pebbles are done by applying chemical on the surface, and hence they are brighter in color. Using ultraviolet-visible absorption spectroscopy, the absorption peak of the color changes on the natural nephrite pebbles show iron oxides F²-, F³-, whereas the applied color changes on the false pebbles do not contain any iron. The sweat pores described by the authors are also seen on the buried nephrite jades. From the description, these should be etch pits result from natural chemical weathering, and not from the collision with other pebbles as stated. Nephrite is probably the hardest pebble in the stream. If they collide with other stones, they are more likely to crack than to chip. Weathering produces etch pits on nephrite surface with characteristics similar to what the paper describe. It is safe to say the pits found on the pebble are etch pits from weathering. It is hard to know what the authors refer to as the nail pattern. From the picture in the article, it seems to refer to the dendritic changes under the nephrite surface. The iron oxide formation is also seen in buried antique nephrite. Like all minerals and rocks, the nephrite pebbles also go through chemical weathering in nature. The three observations to identify the natural nephrite pebbles from the false ones are similar to the observations used to identified the burial nephrite jade from the fake ones. These surface changes are the result of natural chemical weathering of amphibole which we are going to explore next.